Our summer of fun is rapidly coming to an end. School is or will be starting soon, the temperatures are lowering, and Labor Day are all upon us. We’ve had a lot of fun this summer so bidding farewell to this summer won’t be easy. But this Labor Day we’ll be celebrating with a party to celebrate the summer gone by and the beginning of fall just around the corner. With so much going on in our family’s lives right now a simple and relaxing party is definitely key. We’re going to be eating delicious food but food that will cater to a variety of tastes so everyone’s satisfied without spending hours slaving away in the kitchen. Because who really wants to turn on the oven when it’s still in the 90s out? Certainly not me. Our family will be serving up delicious Hebrew National Hot Dogs or rather Chicago Dogs. My husband recently introduced me to this recipe and while I really like chili dogs or even taco dogs, I was amazed at how good a Chicago Dogs really are It’s such an unlikely combination of flavors to me but they all go together really well and transform your meal beyond a typical hot dog into something even better. Place Hebrew National Hot Dog on bun, starting with the mustard add all toppings and finish with celery salt. 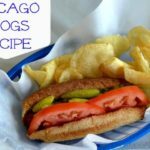 Have you ever had Chicago dogs? What’s your favorite way to eat a hot dog? I am not a hot dog eater, but my husband LOVES a good Chicago style dog! Interesting. I’ve never seen hot dogs served with tomatoes before…..
I’m a Michigan girl, so you betcha that I love a good Chicago dog! Nope never and not too sure I’d like all that stuff on my hot dog lol. I’m a ketchup, yellow mustard and onion girl! I grew up in Chicago and I’ve never had a Chicago-style hot dog. Because when I still ate hot dogs, I liked them plain. 🙂 What a travesty, huh?! I don’t think I’ve ever had a Chicago style dog before. It looks like a great combo! The Chicago dog recipe looks great. I”m a Chicago girl but I only ever tried a Chicago dog once, last summer as sort of a bet. It wasn’t too bad actually considering I usually have my dog with ONLY KETCHUP! That looks yummy! 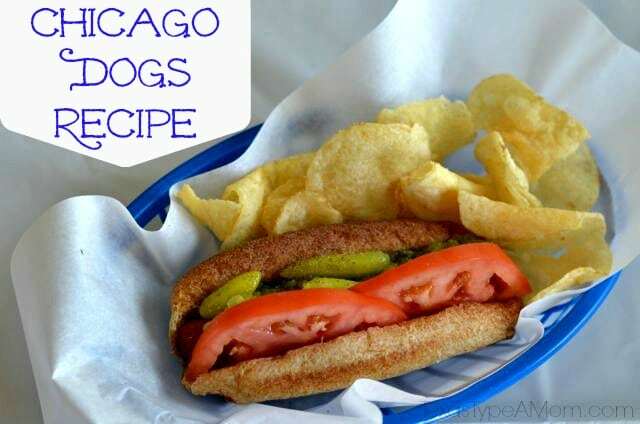 Wouldn’t mind trying a Chicago dog-love tomatoes and a dash of celery salt sounds tasty. 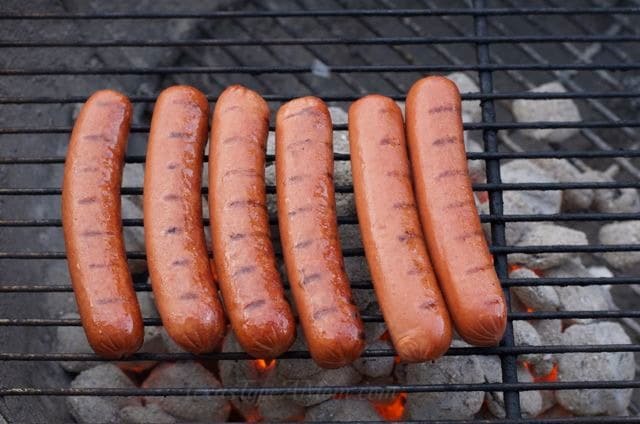 Can’t beat a good quality “dog” on the grill in the summertime! Yum. I am a huge Chicago hot dog fan. Born and bred in Illinois, it is in my blood. ooh I didn’t know there’re so many styles of hotdogs!! Interesting! This looks absolutely delicious! Thanks for the great idea, we can try it at our party. Those hot dogs look really good! I grew up in Chicago so this is right up my alley! I had a Chicago Dog for the first time last summer in Chicago. I loved it! Now that is how you do a hot dog! I could eat the tomatoes & peppers just by themselves.